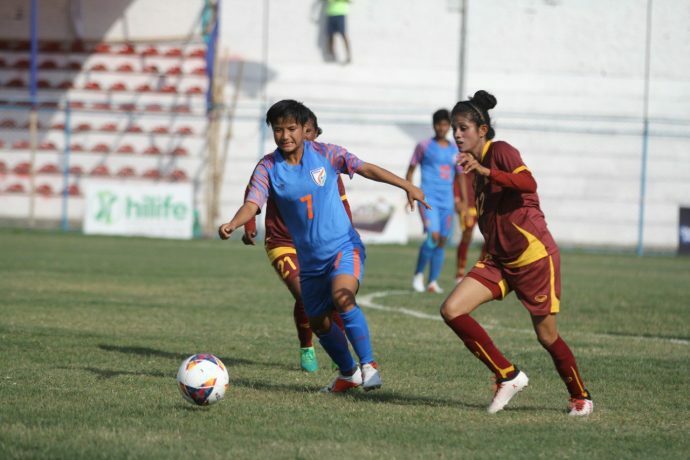 The Indian women’s team sealed their place in the semifinal of the SAFF Women’s Championship with a 5-0 victory against Sri Lanka today (March 17, 2019) at the Sahid Rangashala Stadium in Biratnagar, Nepal. The result extended India’s unbeaten run in the competition’s history to 21 games and secured the top spot in Group B, with all five goals coming from different scorers. One became two just three minutes later, thanks to Sanju’s wing-play again. She broke down the left past the defensive line and put in an inch-perfect cross, which was tapped in by an onrushing Sandhiya. Led by Sanju, the Indian side continued to pour forward and ended the first 45 on the front foot – scoring two quickfire goals again. In the 36th minute, Sanju ran past her marker yet again and put in a cross that caused havoc in the Sri Lankan defence. The ball eventually fell to Indumathi, who slammed it past the keeper into the goal. The Indian women saw out the game till the end, continuing to create chances and control the tempo – eventually picking up the three points comfortably. In the semifinal, they will now take on Group A runners-up Bangladesh on Wednesday (March 20) while hosts Nepal will face Sri Lanka in the other fixture.